Russia's Federal Space Agency lost contact with a new communications satellite shortly after it launched into space due to an apparent communication glitch on the spacecraft's rocket, Russia's space agency has reported. 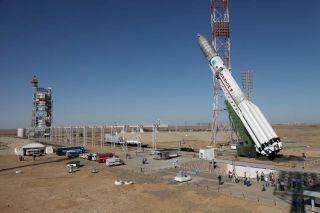 The satellite, called Express-AM4, blasted off atop a Proton rocket on Wednesday (Aug. 17) at 5:25 p.m. EDT (2125 GMT) from the central Asian spaceport of Baikonur Cosmodrome in Kazakhstan, where it was early Thursday morning local time. The rocket upper stage was designed to deliver the Express-AM4 satellite into a final geostationary orbit about 22,369 miles (36,000 kilometers) above Earth during a series of maneuvers. It was during those maneuvers that the malfunction appeared. A commission will likely review the cause of the anomaly, Russian space officials said. The new rocket malfunction is the latest of several embarrassing Russian launch failures or incidents for Russia's space program in a single year. On Dec. 5, a Proton rocket plunged into the Pacific Ocean after engineers filled its upper stage with too much propellant. Three navigation satellites were lost. Then on Feb. 1, a different rocket launched a new Russian military satellite called Geo-IK 2 into the wrong orbit. After a day of searching, Russia's military was able to reestablish communication with the satellite to confirm it was not in its intended orbit. The satellite was built by EADS Astrium, carries 12 antennas and 63 transponders for broadcast services and was designed for a 15-year lifespan in orbit, according to a mission description.